Does participation in global supply chains strengthen anti-protectionist forces and drive openness to multilateral trade? Evidence suggests that the main impact has been unilateral tariff reductions and the proliferation of preferential trade agreements. The internationalisation of supply chains has been very important for fast economic development and industrialisation of developing countries. Before the emergence of supply chains – and the information and communication technology revolution that underpinned it – industrialisation involved building a strong industrial base, often behind the protection of tariffs. The unbundling of global production has made it possible for countries to industrialise by joining international supply chains. There are three mechanisms through which production unbundling can lead to unilateral tariff reductions. First, the offshoring of production is likely to alter lobbying over trade policy in the host country. 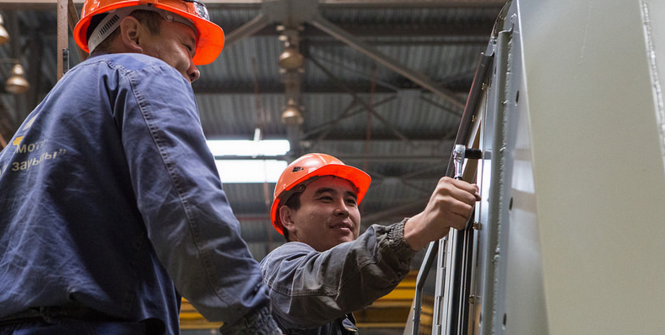 The relocation of production transforms importers of products into exporters. As a result, lobbying in favour of import tariffs on these goods decreases and pressure to reduce upstream tariffs increases. Secondly, a fall in coordination and communication costs may also have an impact on lobbying. With high trade costs, producers of final products may support infant industry protection of intermediate products if they believe that it could lower the price of domestically produced intermediate goods compared with imports. Thirdly, offshoring improves the competitiveness of developed countries’ products by reducing their costs, thus undermining import substitution strategies. Empirical evidence seems to confirm that lobbying is indeed an important determinant of trade policy. In particular, there is evidence suggesting that supply chains can explain why the recent financial crisis did not lead to significant protectionism despite the fact that many countries had prudence in their applied tariffs, meaning they could raise them without violating their World Trade Organization (WTO) commitments. The changing dynamics of trade policy brought about by the internationalisation of supply chains has not only resulted in unilateral tariff reductions but also in negotiated tariff reductions in the WTO, such as the Information Technology Agreement, and, even more significantly, in fast-proliferating preferential trade agreements (PTAs). While in many cases, particularly in Asia, these PTAs are aimed at mutual integration and rule-making, they typically also include a traditional tariff component. In other cases, such as PTAs in Africa, tariffs are central to the agreements. The fact that governments respond to the internationalisation of supply chains by signing deep integration agreements at the regional level is broadly consistent with the limited amount of theory on this topic. Deep rather than shallow integration agreements and more individualised rules are needed to address the policy problems associated with the internationalisation of supply chains. Countries intensively involved in supply chain trade may find it increasingly difficult to rely on broad WTO principles alone to address their trade-related problems and may turn to more narrowly focused PTAs to achieve the deep and customised bargains they need. If trade is perceived by a majority of voters as causing unemployment and/or increasing inequality, governments could refrain from pursuing further trade opening and may even be tempted by protectionism. With regard to increased pressure for protectionism, there is some evidence that the WTO has played a significant role in recent years in preventing protectionist barriers. WTO rules and governments commitments, together with reinforced monitoring mechanisms, may account at least in part for the limited protectionist reactions to the crisis. Negotiations for the bilateral PTA could be vehicles for establishing a “WTO Plus” system. These agreements establish effective rules regarding neomercantilist practices and eschew special interest provisions. A WTO Plus system would both open markets for countries willing to accept strengthened trade rules and put pressure on non-participating countries to further open their markets and adopt similar rules in a future multilateral trade round within the framework of the WTO. Participation in global supply chains tends to strengthen anti-protectionist forces. The internationalisation of supply chains is very important for fast economic development. This process also changes the political economy of trade policy, creating in many countries a strong incentive to undertake unilateral tariff reductions. The changing dynamics of trade policy brought about by the internationalisation of supply chains have also resulted in negotiated tariff reductions, especially through fast-proliferating PTAs. Bilateral and regional trade agreements have emerged as the alternative to multilateral WTO agreements. Governments will need to ensure that regional agreements and the multilateral trading system are complementary and that multilateral disciplines minimise any negative effects from PTAs. A few multinational firms are responsible for a major share of world trade. On the one hand, these firms should support regulatory harmonisation across different PTAs to lower trade costs. On the other hand, they might also resist harmonisation – and encourage certain non-tariff measures – in order to prevent new competitors from entering markets. In this situation institutional reforms will be necessary to restore the WTO’s ability to complete multilateral trade agreements, including a more flexible application of the consensus rule. WTO members must develop new ways to work, especially with developing countries. It is important also to find common ground to negotiate mutual gains from foreign trade and new models of foreign trade policy with the rise of global supply chains and new forms of cooperation between developed, developing and emerging countries like China, India, Brazil, Mexico and South Africa and the USA and European Union. Dr Zdzisław Puślecki is a Professor in the Faculty of Political Science and Journalism at Adam Mickiewicz University in Poznań, Poland. This article is adapted from his presentation “The Impact of the Rise of Global Supply Chains on the Political Economy of Trade and Countries’ Motivations for Cooperating on Foreign Trade Policies” at the International Political Science Association World Congress on 21-25 July. 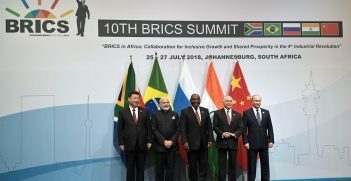 The BRICS Summit in Johannesburg last week took place in a global economic and political landscape greatly destabilised by the Trump Administration. Despite difficulties, the BRICS grouping remains the most important political grouping without Western participation. 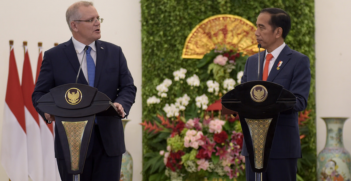 By considering recognising Jerusalem as Israel’s capital, Prime Minister Scott Morrison has jeopardised the Indonesia-Australia trade deal. Domestic political pressure will preclude Indonesia from signing while Australia is contesting one of the holiest subjects in the Islamic world. 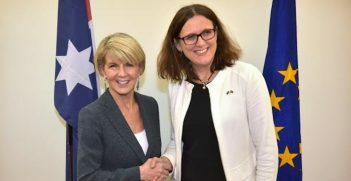 The free trade agreement between Australia and the EU promises to deliver strengthened political collaboration and increase economic integration. What are the motivators and issues from a business perspective?